This Auto Sputter Coater is ideally suited for high quality coating of non-conducting samples for standard SEM imaging. The added functionality of the automatic features enable fine grain coating on a range of samples with a choice of target materials. The automatic purge and leak functions together with the optional High Resolution Thickness Controller offer consistent thickness for optimized conductive coating results. Cool, fine-grain sputtering is achieved with a very efficient low voltage DC magnetron head. 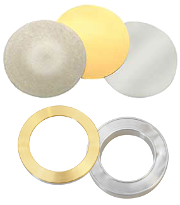 The quick change target method allows a range of metals to be used. The 108 Auto Sputter Coater offers the choice of fully automated or manual operation. The specifications also include automatic vent (with a choice of vent gas) and argon purge control. In automatic mode, the coater can be controlled in two ways. The digital timer can be used to give repeatable coatings or the High Resolution Thickness Controller (optional) can be used to terminate the sputtering process at the desired thickness. Alternatively. 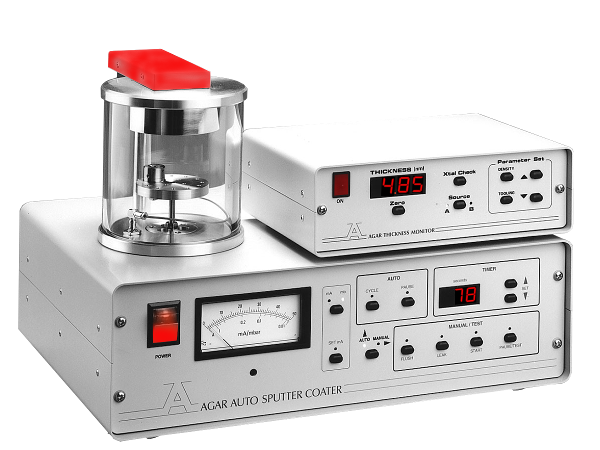 The digital sputter current control is fully independent of the argon gas pressure in the sputtering chamber to achieve consistent sputtering rates and optimum specimen coverage. The efficient DC magnetron operates on a low voltage for "ultra-cool" sputtering to avoid effects on sample surface. Separate electronic valves for leak, purge and vent, coupled with a precise needle valve, ensures quick and easy operation. Quick target change allows for a range of materials used: Au, Au/Pd, Pt, Pt/Pd (Au fitted as standard.